ahra 1 is a large, Ubaid-period site in the Al-Subiyah region in Northern Kuwait. The material culture of the site combines Ubaid and Arabian Neolithic characteristics, proving intensive contacts of the settlement’s inhabitants with Mesopotamia in the second half of the 6th millennium BC. The site has been excavated since 2009 by a Kuwaiti–Polish Archaeological Mission. 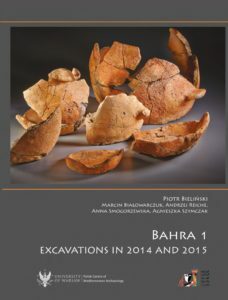 In this volume the results of the 2014 and 2015 seasons of fieldwork have been presented, offering an insight into the settlement’s architecture and its development in consecutive building phases. Separate chapters discuss the assemblage of finds from the reported seasons. The rich pottery collection of over 6,200 fragments included almost equal shares of Ubaid Ware and Coarse Red Ware potsherds. The prolific lithic material (over 30,000 tool fragments and debitage) forms a specialized assemblage oriented towards the production of tubular shell beads. Evidence for the existence of bead workshops at the site comes also from the small finds assemblage, a considerable part of which is related to the bead production process. An exceptional find was the discovery of a copper object in one of the older layers of the settlement.